Does your home have enough storage? I am yet to meet anyone who has enough storage in their house. Having enough room to store everything in your house is not necessarily related to the size of your house. A large house with no cupboards can have less practical storage than a small house with clever storage options. The secret lies in seeing potential storage opportunities and making the most of them, like these wall-mounted towel baskets for your bathroom. It keeps the towels where you need them - in the BATHROOM! No more nudie runs to the linen cupboard to grab a towel when you forgot to get one before your shower. 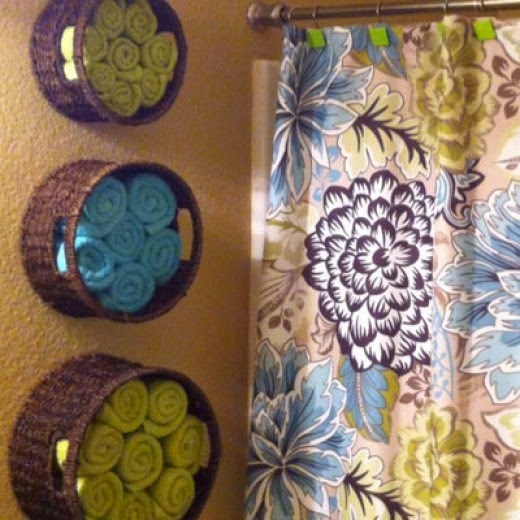 They're stylish - these baskets are a design feature that look great on your bathroom wall. We love the colour-coordinated towels and shower curtain. Most bathrooms rarely have another bulk storage space to keep big items like towels. After all, you don't want to waste your previous vanity cupboard space on towels! They're inexpensive - baskets like these are easy to source these days a will only require a couple of screws to secure them to the wall. They are versatile - you can choose how many baskets, what shape and size you go for. You can add more later if you need extra storage. Also consider other options such as wooden or plastic creates - anything that works well with your existing bathroom decor. They add value to your house. If you ever come to sell your property, buyers will appreciate storage solutions. Where do you store your bathroom towels?